You are here: Home / Den Talk / Musings from the Den: Slow starts, promising signs, bad humour and the great Calvillo. Musings from the Den: Slow starts, promising signs, bad humour and the great Calvillo. I thought it might be time for some random thoughts after the first two weeks of the CFL season. There have certainly been some surprises to start the year and some events that leave you shaking your head. Feel free to comment below and leave us your musings on the season so far. The BC Lions 0-2 start is a mild surprise. Not overly shocking considering they played two of the league’s expected contenders to start the year. Both losses were by a close score, although one could argue the Montreal loss result was the Alouettes easing off a bit in the 2nd half. So now once again the Lions find themselves in the hole to start the season and next up is the red hot Edmonton Eskimos. Even the most die hard Eskimos fan can’t say they saw their 2-0 start coming. Granted the Eskimo wins have come against two other struggling teams in Saskatchewan and Hamilton, but they are winning in impressive fashion with a combination of a lethal passing attack and most recently the strong running of former Lion Jerome Messam who will undoubtedly have something to prove when he suits up Saturday. Speaking of the running game, as anyone seen the BC’s? They seem to have abandoned that part of their game. In game one you could argue that because they got down by 17 so quick they had to go to the air, but in game two the same lack of ground attack existed and when it did it was stuffed. If the Lions are to have success this year they will have to find more balance to their offence or it will be extremely one dimensional. Things are not all gloomy however. The Lions seem to have found a solid replacement for Yonus Davis in Tim Brown. Brown has all the speed and shifty moves of his predecessor and has some wondering whether he should be getting a bigger role in the offence. It’s never been Buono’s style to use his returner regularly in the offence but Brown will and should be featured in a few packages before the season is done. Travis Lulay has come as advertised, and if not for several dropped passes against the Stamps would have put up massive numbers after two games. The Montana State quarterback has settled in nicely to the starting role and with more support from his receivers should be just fine. The Province newspaper is in my opinion the best Lions coverage in the city, bar none. The sports department there is very good at what they do and there is no better football writer in the country right now in my opinion than Lowell Ullrich. So when I saw this cartoon posted by their editorial cartoonist Bob Krieger I was pretty disappointed. Yes, I get that the intent was to say even an injured player could play running back for the Lions since they never call a running play anyway, but considering that the Lions’ Stanley Franks is facing an injury that may end his career, it was pretty inconsiderate. I was going to blog more on this but the very competent Andrew Bucholtz at Yahoo.ca said everything perfectly in this piece. 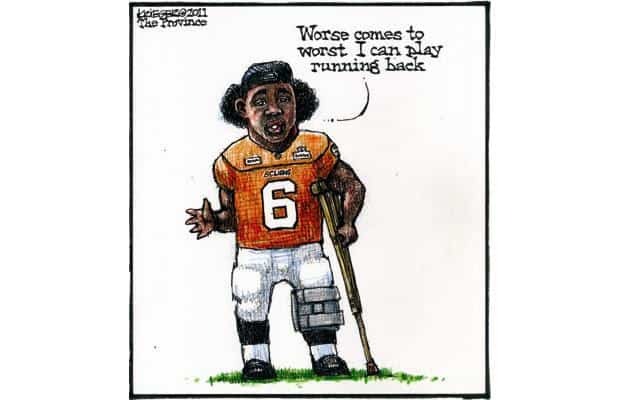 The cartoon drew the wrath of Franks’ teammate Dante Marsh who told me that at this point he and his teammates are just praying for a full recovery for Franks. Let me add those prayers and best wishes on behalf of BCLionsDen.ca. If there is comfort to be found with the Lions slow start, it’s the fact that the Saskatchewan Roughriders are also winless after two games. The Lions have been here in the past starting 1-7 last year and clawing back to make the playoffs. The Riders lost both games at home and the natives are restless in Regina. They face Hamilton on the road this week and of they go 0-3 there could be a lot of manure on driveways pretty quick. 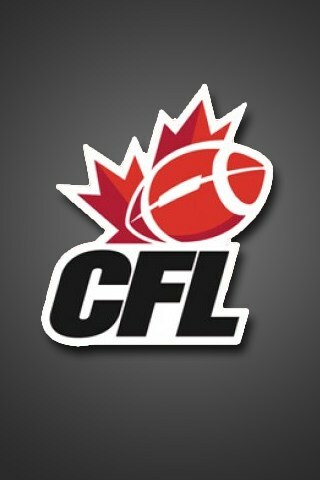 After this week the Riders face Montreal, Calgary, BC and Calgary again in the next four games. What can you say about the amazing Anthony Calvillo? The Montreal quarterback is quickly approaching greatest of all-time status, if he isn’t there already. This week, barring a defensive miracle, Calvillo will become the CFL’s all-time leader in touchdowns thrown, surpassing Damon Allen. In his first two games of the year Calvillo has completed 51 of 73 passes for a 69.9 completion percentage a QB rating of 132.9 and has thrown 8 touchdown passes, including five last week against the Riders. Before Calvillo is done he will be the greatest of all-time statistically but fans of the CFL should really savour watching this guy play the game now.